Institute defender Ryan Morrow was sent-off against Larne. Institute gaffer Kevin Deery was fuming that another rash decision by Ryan Morrow resulted in him receiving his second dismissal of the season. The feisty right-back was fortunate to be still on the pitch after the break, as a poor lunging tackle in the first half only resulted in a yellow card. “I’ll tell you why it’s disappointing because I spoke to the two players who were booked at half-time and I said to them to not make any silly tackles and it was absolutely needless from young Ryan Morrow,” said Deery. 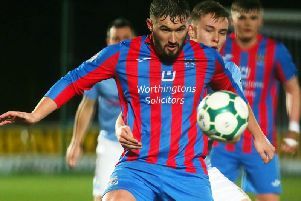 “He has been cracking for us this season, he’s a cracking wee player but there was absolutely no need for the challenge and he’ll probably miss one of our most important games at Ballyclare Comrades in the Irish Cup this week. Only a few weeks ago he made another rash tackle which resulted in Annagh United scoring from a direct free-kick to earn a point for the bottom side and Deery is hoping the penny will finally drop with the ex-Trojans man. “He absolutely needs to learn,” added the Stute boss. “He’s very keen and he’s very hungry to do a good job against the man he comes up against and you can’t take that out of him, but he needs to do it in the right areas. “His tackle for his red card was actually lucky it didn’t cost us another goal, because it was in a dangerous area.